There a number of different ways to show your love and affection to someone, however jewellery and diamonds just seem to be favoured among the rest. It’s not surprising with all of the glamorous and exquisite jewellery that is out there! But some of us still are a little unsure on what the different items of jewellery actually mean and what may be the best for you? So here at AGnSons we have come to help you out, let us help you say it better to your loved one. There are a wide range of items that symbolize a range of different things but we have picked out a few that are most popular and you can also find any item that you see in this blog from our online store! 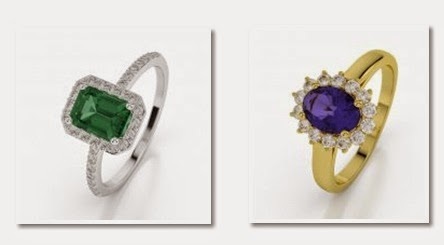 You may have seen a three stone ring before as they are a rather popular accessory. However they are not just popular for the look of the ring but they have a special meaning behind them. These three stone rings are supposed to mean ‘the past, the present and the future’. So when given to a partner it shows that you leave the past behind, focus on the present times and look forward to your future together. So therefore this would be a great ring to give to a loved one near the beginning of t relationship. Bridal set rings do not have a particular written meaning as such but the gesture and the situation that it is given in says it all. Bridal set rings represent the sign of a promise. The first ring is the engagement ring and then the second item of the set is the wedding ring that the bride receives on her wedding day from the groom. So once the bride has the two rings, both on her engagement finger this is classed as a bridal set, and the bride will usually never take the rings off therefore representing to the world that she is a married women. Bridal set rings can be bought together although if you wish to by the two rings separately this will still count as a bridal set. If you buy the two rings together as a set then they can be given together at the same time on the wedding day or before, and they can also be given separately. So for example you take one of the rings and give it to your loved one as an engagement ring and then give the other ring on the wedding day. Eternity rings are a ring usually given from a man and are received by a women. The rings represent never ending love, and as the circle is a circle, a whole it is said that it represents the couple are a one unit. The ring is usually given as a gift on an anniversary, birth of a child or simply out of the blue to just show compassion. Eternity rings are a band made of either gold or metal and have a continuous line of identically cut gem stones or diamonds, although diamonds are the most popular choice. Most eternity rings are usually very similar to each other. Although you can get a full eternity ring which has diamonds or gemstones all the way around it, or there is half eternity rings that only have half of it covered in diamonds or gem stones. Even if you choose a half eternity ring or a full one the meaning still stays the same, there is no difference between the two apart from the look of the ring. Engagement rings might just be the best ring to give if you want to show true love and commitment to your loved one. Not only will your loved be receiving a ring but you will also ask for their hand in marriage, and this is a lifelong commitment that will last longer than any ring possibly could. The ring its self represents to the world that the women is due to be wed and it also shows undeniable love for her husband. Wearing an engagement ring also signifies that you have agreed to marry the man who has given it to you, as the engagement is not official until the ring is worn, and should not be taken off. There are no particular features that an engagement ring must have, you can choose any ring that you want and give it to them. Did you enjoy this blog? If so stay social and let us know! You can get in contact with us via our Twitter or Facebook page or simply leave a comment below.